When chairing a meeting, you want to make sure you get all your points across. You want to keep people interested and participating. Preparation is very important. You need to plan for your meeting, have an agenda written up so that you don't go off topic, or forget important points. The discussion needs to be steered to the right end. Imagine you're the captain of a ship and have to reach a destination, come hell or high water. It can be very easy to get stuck on the first few items on the agenda, and not getting round to the whole list, so you need to stay on course. Allotting time to each point, with more time for the most important ones, is a good idea. Put the most urgent points at the top of the list. Read the list out at the start of the meeting, and then go through each point in succession. As the chairman, you need to demonstrate assertiveness. That doesn't mean you have to be rude or overbearing, you need to make sure everyone is heard. Ask questions, listen to the answers, and keep people involved. If the meeting is just you running a monologue, chances are people will have difficulty giving you their full attention. Try to keep things interesting, you don't need to make a song and dance about it, just keep things moving. If you finish all your points before the allotted time is up, try not to come up with extra things, finish early. Everyone will appreciate that. I'm sure everyone has experienced problems in meetings, sometimes people get argumentative or confrontational. It's your job as Chair to keep things on an even keel. If a member starts to dominate the discussion, perhaps you could say something like 'That's a good point, what do other people think?'. Be encouraging if someone comes up with a good idea or solution, everyone likes to receive praise, it makes them feel appreciated and that their points are valid. 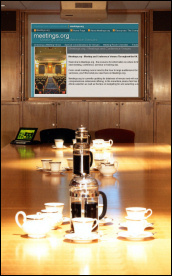 When wrapping up the meeting, summarise the points and the outcomes of the meeting, write up the minutes and decisions made and send a copy round. The most important thing is to make sure you're prepared, that you know exactly what needs to be said, what decisions need to be made. Careful planning will give the meeting a clear objective; you don't want to have meetings just for the sake of having a meeting, or that run on too long.